We offer Colored Mica to our clients. This is the newest entry to our products list thanks to our in-house research team. 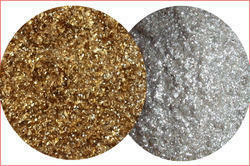 We are now producing colored mica flakes & powder. There are two types of colored mica flakes that we are producing; Calcined-Colored Mica Flakes & Normal Colored Mica Flakes. The former being calcined prior to the coloring process. It helps the color-effect to be more bright & enduring & the second one being just colored mica without calcining it. Natural mica flakes is mixed with special dye/color along with epoxy resin to give it a permanent/wash-proof color. Gold & Silver are the two most demanded products from our product list. This also is our latest innovation in Mica. These two are 100% Natural colours and hence it does not lose its appearance/identity at any temperature and weather conditions. 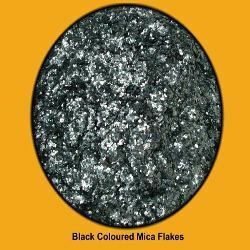 We offer Black Mica Flakes to our clients. This is black colored mica flakes of 10-100 meshes. We produce in various Mesh Range as the buyer requires. Uses: They are used for decorative purposes and also in various Ayurvedic medicines. Black Mica has very high lusture as its surface is very smooth and glossy. 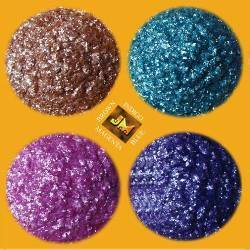 We offer Colored Mica Flakes to our clients. These are four colors available in colored mica chips besides black, copper & Silver (Natural Colours) that we are producing in bulk. Starting from top left clockwise : brown, indigo, blue & magenta. Categories: There are 2 broad categories that we divide these colored flakes into - Natural & Processed. We have Black, Bronze & Silver under Natural Color and the rest of them are all processed colored flakes. Looking for Colored Mica ?